The series premiere of The Bridge on FX has been teased and marketed for quite some time now. And the marketing, as time proceeded, seem to promise a dark mystery. And from all intent, it seems the 90-minute premiere did just that, and then some. The episode opens at a bridge the crosses the border between the U.S. and Mexico. Suddenly all the lights go out, a car rushes out onto the bridge, a man hops out, places a dead body in the middle of the road, then scats. The lights and power come back on just as the car is passing out of camera range. But not before the cameras get a snippet of the licence plate of the car rushing off. From our first few clues, we see that the perp is technically savvy, if he can manage to shut down power to a bridge just long enough to pull off his stunt. And after that, our lead character, Detective Sonya North (Diane Kruger) shows up and takes the lead in this murder investigation. And subsequently, she later joins forces with Mexican detective Marco Ruiz (Demián Bichir). And that's how this dark, morbid crime drama begins. Other things take place, but I'd rather not spoil this episodic ride for you, so bear with me. This series premiere episode laid the groundwork for several situations and characters, and does so in such a way that shows you something is happening with each one, but doesn't quite fill in all the details. It's up to you to watch closely and to be filled in later, in subsequent episodes, and judging from this ep, I'm sure we will all be tuning in. What's interesting is that we meet folks who seem to be seriously flawed and those flaws may or may not interfere with their jobs or life. Det. North has a multitude of issues that causes her to see things only in black and white. And her flaws drive me crazy. They're done well enough that I don't like North one bit, hence, kudos to Kruger's delivery of the character. Ruiz has his own set of flaws, but they're more from outside sources, like his corrupt police captain, red tape, and the apparent lazy approach within his division, to past crimes. Other cast includes Annabeth Gish, Ted Levine, Emily Rios, and Eric Lange. Lange is playing a character that I am pretty sure is evil, but even though he's done things to strongly suggest that, I haven't seen actual evil deeds yet out of his character. I'm sure he is. I'm just taking the high road and waiting for it to happen. The adversary in this series, is going to be giving Det. 's North and Ruiz quite the run for their dysfunctional money. He's smart, ruthless and as evidenced by a second deed, techically savvy. The Bridge, is, as promised, a pretty dark and engaging show that parrellels in its own way, Fox's The Following. I can't wait to see where this story develops, because it's twisted and sordid. To back up my expectations, the resume of the creator/executive producers lends itself to that expectation. Meredith Stiehm has worked on Homeland, Cold Case and ER, while co-creator Elwood Reid's resume includes Hawaii Five-0, Undercovers and Cold Case. 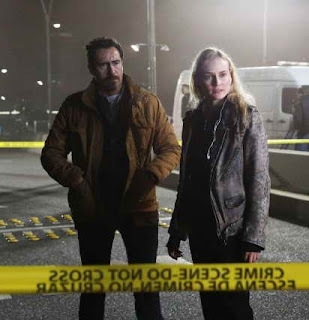 I think we'll be in for one crazy ride on this new FX summer series, The Bridge.